Lovely debut of Somerset's first art calendars, yay!!! And so, that is how it came to be that the girls can now be found in my shop, right here. 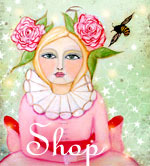 You will also find details about each painting in my shop. Also, as I eluded to in this blog post title, there is a treat involved here. I have one 2010 Somerset Art Calendar to give away!